The Sino-Japan Youth Conerence was a big success! 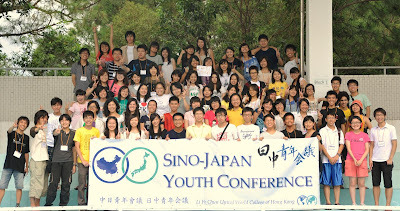 The Sino-Japan Youth Conference was held in Hong Kong from August 11 to 19, 2009, organized by Li Po Chun United World College of Hong Kong. The organizers were mostly university students who are also graduates of United World Colleges, an international network of colleges with the aim of promoting international understanding and peace. The goal of this conference was to "increase intercultural understanding and mutual respect through cultural activities, discussions on Sino-Japanese relationsihp issues, and service activities conducted in Guandong Province." Congratulatoins, Chishio Furukawa, the chief organizer and a gradute of Li Po Chun College, and Xiaoxue Weng, a gradute of Leter B. Pearson College, and other committee members for the successful completion of the program! The program report will be posted at a later date. * Peace Philosophy Centre was one of the sponsoring organizations for this Conference. "Peace Philosophy Salon" is held mostly on Saturday evenings at Peace Philosophy Centre in Vancouver, BC, Canada. It is an informal gathering in which we learn and discuss issues on peace and sustainability. The past sessions covered Japan's Constitution, Senji Yamamoto, Hiroshima/Nagasaki, and Nanjing Massacre. We will hold the fall sessions on the following Saturday evenings. Topics and detailed information will be posted later. Please see here for reports of past Salons. We look forward to another season of mutual learning and fun! We apologize for the silence over the summer. We take a group of Canadian students to Hiroshima and Nagasaki every summer, and that make it difficult for us to update our blog regularly. We had another intellectually stimulating, and emotionally engaging tour to the two cities where the first and the last atomic-bombs were dropped on hundreds of thousands of civilians. Regarding the bombing on civilians, before the Hiroshima/Nagasaki trip, I had an opportunity to visit the the Center of the Tokyo Air Raid and War Damages again with my 82-year old father whose family house was burnt down in the Yamate Bombing of May 25, 1945. Masahiko Yamabe, chief curator of the Center and Seiji Ishibashi, one of the guides there, are among the authors of the newly published book and DVD "Tokyo, Guernika, Chongqing," as the fourth of the series of Iwanami Peace Archives, of which the first three were on Kyoto Museum for World Peace, the Battle of Okinawa, and Hiroshima/Nagasaki. The Center was holding a special exhibit with the same name as the book title to commemorate the publication when we visited. The exhibit helps visitors grasp a broader picture of the history of the firebombing of civilians. While many Japanese peace museums tend to focus on the firebombing of their own cities and Hiroshima/Nagasaki, portraying Japan more as a victim than a state responsible for starting the war and afflicting so much suffering in many parts of Asia, this Center bravely exhibits the horrific photos and records of Chongqing Bombing, in which both Japanese Army and Navy conducted hundreds of bombing operations from December 1938 to August 1941, years before their own cities were firebombed. Not many Japanese know this fact and few Japanese children learn about it at school. I would also like to introduce a recently-published book in English "Bombing Civilians - a twentieth-century history" edited by Yuki Tanaka and Marilyn B. Young (The New Press, 2009), to which chapters are contributed on the bombing in the Iraqi War, and on European and Japanese cities, and Chongqing during WWII. I wanted to share this deeply moving and alarming memoir that Daniel Ellsberg wrote for the Hiroshima Day this year. "Hiroshima Day: America Has Been Asleep at the Wheel for 64 Years"
The same article is available in Japan Focus with photos. Chugoku Newspaper ran a shortened version of this article on August 24, 2009 as part of the series "Hiroshima and the World." The Japanese version is here.